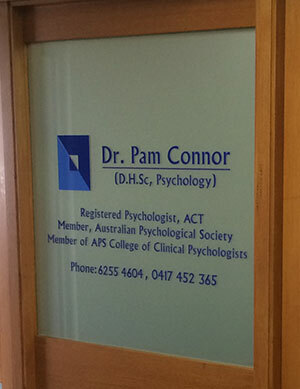 Dr Pam Connor is a registered psychologist (Registration Number PSY0001407041) in the ACT, specialising in clinical psychology. She holds Full Membership with the Australian Psychology Society (APS), with Full Membership of both the Clinical and Health Colleges of the APS. Dr Connor has worked in the field of mental health since 1997, in both the public and private sector, with prior experience in counselling and education. She is currently in full-time private practice, having retired from a long public sector career at the end of 2014.